The Superior 25KM Trail Race is an extremely hilly, rugged and technical out-and-back (100% trail) trail-race which traverses the Sawtooth Mountain Range on the Superior Hiking Trail in the far reaches northern Minnesota . The course parallels Lake Superior, the greatest freshwater lake in the world, climbs to near 2000′ peaks with breath-taking vistas of the lake and inland forests and crosses whitewater rivers and serene streams while meandering through mystic Boreal forests. The race starts and finishes at Caribou Highlands Resort in Lutsen Minnesota. Runners will have access to 1 aid stations between the start and finish. Please note that entry fees are not refundable under any circumstance, race registrations are not transferable to other participants or future years races, additionally we do do not allow transfers between distances. Please consider these factors carefully before registering – thank you. Emails requesting any of the above will not be answered. A well marked course with plenty of aid and tons of friendly, experienced volunteers. 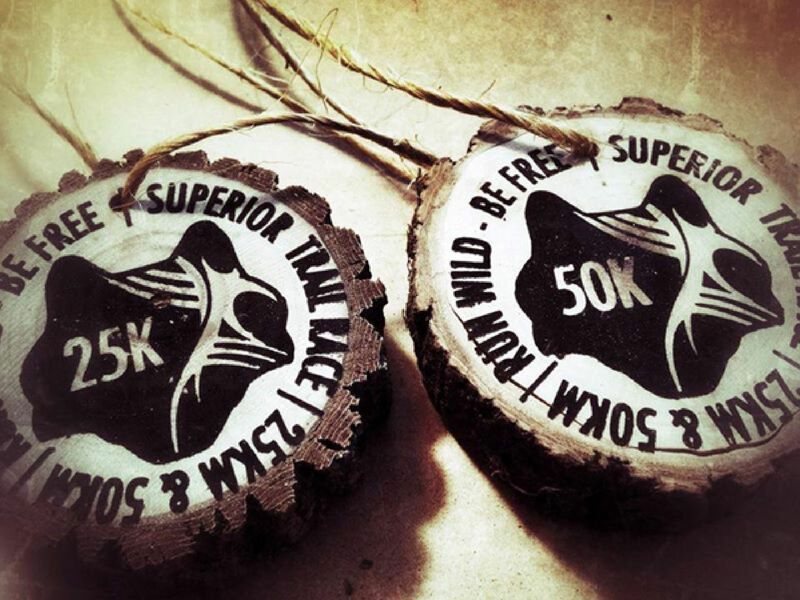 All runners will receive a beefy wood finishers medal – see it HERE. Each runner will receive a complimentary post race meal. All participants will receive a high quality cotton / tri-blend t-shirt – see past shirts / swag HERE. The race start is approximately 1:15 North of Two Harbors, 1:45 North of Duluth and 4:00 North of Minneapolis, Minnesota. Minneapolis (MSP) has a large international airport and Duluth (DLH) has a smaller regional airport. Caribou Highlands Lodge in Lutsen, MN is the race host hotel – the race finishes at Caribou Highlands and the finish-line will be just a short walk to your room. We recommend that you stay here and support Caribou Highlands as they do a great job supporting us! Special room rates are available if you mention you are a Superior racer. Call 1-800-642-6036 or visit their Website at http://www.caribouhighlands.com. Caribou Highlands’ address is 371 Ski Hill Road, P.O. Box 99 in Lutsen, MN 55612. Friday, May 17th, Caribou Highlands Lodge, Mountain View Conference room 4:00 to 7:00 PM and Saturday, May 18, 5:30 – 7:30 am. The Mountain View Conference Room faces the outdoor pool (and the outdoor pool is right next to the finish line by the patio area behind Caribou Highlands). There are no drop bags for the 25KM race. An optional pre-race briefing will be held on the Caribou Highlands Lodge Patio / Superior Trail Race finish line on Friday, May 17th, at 7:00 pm. We will also do a quick runner briefing at 7:50 AM on Saturday at the start-line just prior to the start of the race. Early Mid-May in Northern Minnesota – we can have highs in the mid 80′s and lows in the mid 30′s or, believe it or not, a combination of both! Rain is not uncommon and either is mud. All of the snow is usually gone but you may see a small patch here or there. Be prepared, watch the forecast and plan accordingly. Your timing chip will be affixed to the back of your race number. Do not remove your timing chip. 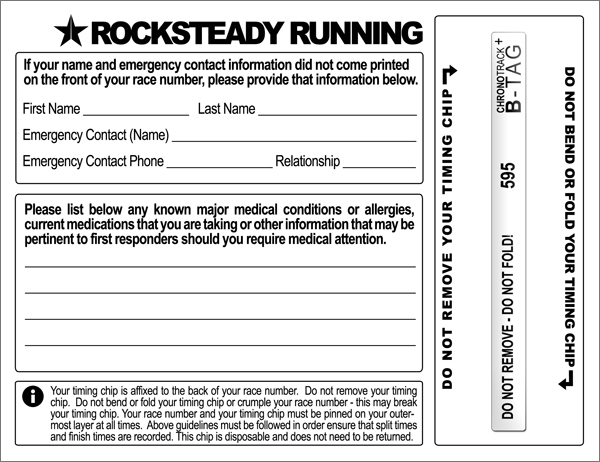 Do not bend or fold your timing chip or crumple your race number – this may break your timing chip. Your race number and your timing chip must be pinned on your outer-most layer at all times. Above guidelines must be followed in order ensure that split times and finish times are recorded. This chip is disposable and does not need to be returned. HERE is a rendering of the back of your race number / bib illustrating where your timing chip will be placed. The course will be marked with Orange flags, which will always be on the left hand side of the trail outbound and on the right-hand side inbound. The Superior Trail 50 KM primarily follows the Superior Hiking Trail – you can also look for the official Superior Hiking Trail signs for assurance that you are on the right trail. Throughout the race you will encounter intersecting trails and Superior Hiking Trail “Spur-Trails” – in the 50 KM the only time you will ever take a “Spur-Trail” or a trail that is not the superior hiking trail is just after the start and right at the finish as you follow the road to the Poplar River / the SHT trail-head on the way out (reverse on the way back) – this will be clearly marked. It is unfortunate but is not unheard of at many of the major trail races that course vandalism has occurred and flagging has been intentionally moved or removed by small minded individuals – it is important that you study the course maps prior to running and have a concept of where you are going – also, always remember, you are supposed to be on the Superior Hiking Trail only – except in those specific instances listed above. Our aid stations are manned by volunteers, all of them spending a good part of their day out there and weekend up north to help you! Please be sure to thank the volunteers. A complete list of the aid stations can be found HERE. Food and Drink – Aid stations will have the following beverage and food choices available: Water, Hammer Heed, Hammer Gel, Soft Drinks, Peanut Butter Sandwiches, Potato Chips, Potatoes & Salt, Cookies, Candy, Fruit. It is not yet mandatory at our event but we may be heading in that direction, please exercise common sense and carry a water bottle or hydration pack. Miles do not click off during a trail race as fast as they do in a road race and aid stations are not always as frequent – this lends to a real sense of “aloneness” and adventure at times but if you are not carrying a water vessel can also lead to thirst and dehydration. Aid station locations and distances can be found HERE – don’t get caught without what you need, take care of yourself and be responsible. Due to our past experience with people wearing headphones on trail runs such as these, we discourage their use however we won’t tell you can’t wear them . Full awareness of one’s surroundings, and the ability to communicate with other participants, race volunteers, and trail users not associated with the event are critical to everyone’s safety. Please use common sense. Don’t do it. If you see some trash someone else has dropped, pick it up. Keep the trail clean at all costs. For the sake of our volunteers, we’ve established closing times for the aid stations. Those closing times also provide good guidelines for novice racers who want to finish by the time the finish line closes at 4:00. Any racer who finishes after 4:00 will receive a finisher’s award but his / her time will not be recorded. The Oberg aid station will close at 1:30. * There will be no official awards ceremony, we will hand out awards shortly after runners finish. Caribou Highlands Lodge will furnish shower facilities and towels for runners who are not staying at the lodge.